Organizations are often unable or unwilling to estimate project effort or cost. I get it. Detailed estimating is hard and requires work. A lot of times, our project has already been approved to enter execution – and we had to do estimates to get through the approval process. What would be the point of preparing any further estimates? After all, isn’t the budget sufficient for executing the project? -Kenneth Boulding, “General Systems Theory: The Skeleton of Science,” Management Science (1956:197-198) – reprinted in Strategy Safari. From an academic standpoint, budgets are developed from the top down and define the limits within which you can spend. As I discussed in The Importance of Cost Abstraction, estimating is required for project control. But how do you know when you’ve estimated enough? How do you know when the estimate is thorough enough for project control purposes? Sometimes we go through several iterations of budgeting – until the final product is actually quite developed. How do I know when I’m done? The answer is that you know the estimate is thorough enough when it is detailed enough to support your control purposes. Huh? To paraphrase the PMBOK, “The process is detailed enough when it generates an output sufficient to support the next process.” This means that the estimate is sufficient when it supports the next process downstream, or the project control process. Now, here’s the trick. One process’ estimate is the next process’ budget. Meaning that the estimate I developed in pre-approval, which might allocate work by role and by month is insufficient in detail for project execution, where I am focused on elements of near term resource contention. Hence, I need to take my estimates by role and by month, feed them into my scheduling process, and develop a detailed estimate of resources by name and by day. Repeat as required. With each successive process, I take the estimate from the last process and refine it even further. When it gets to the schedule, specifically a schedule created to drive resource management, the estimate is key. And at this point, the estimate should not be driven by resource allocation requirements. At this point, the estimate needs to be driven by the work. 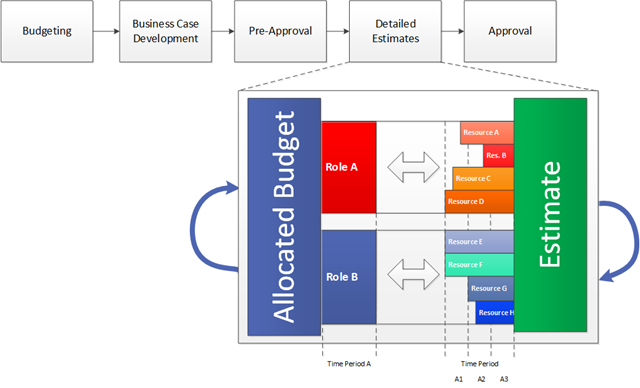 That work may then be mapped back to the allocation to define project feasibility. The estimate needs to be driven by the thing. The specific deliverables of the project must be decomposed into a WBS, and then the tasks required to generate that defined (using an SDLC) and mapped to each of those deliverables. Work estimates may then be placed on each of those tasks. If you took another approach, you are wrong. You’ve created a reporting schedule, i.e. a simple construct that shoehorns the expected data into the expected shape – not something that accurately models the future. Where is a problem identified in this estimating chain? A problem will exist when we can map the detailed process output back to the less-detailed process input and determine that there’s an issue. Either the detailed estimate exceeds the amount allocated at the beginning of the process or the detailed estimate comes in significantly below the amount allocated at the beginning. Either of those results indicate that the process is working – and that we’re developing our estimates properly. If any of the steps in the project approval process cannot either validate or invalidate the original allocation, then they should be revisited. How do I know when I’m done? When the estimate is driven by the work. When I’ve decomposed the deliverables of the project into specific tangible things. And when I can tie each task back to one of those things, and then to a specific work estimate. That’s when I know I’ve reached the end of the estimating road: when the schedule is the thing. Don’t know if you saw this, but on behalf of everyone at UMT, I am proud to announce that we’ve placed in Gartner’s Magic Quadrant for Integrated IT Portfolio Analytics. With IT budgets reaching hundreds of millions of dollars, CIOs find themselves under increasing pressure to reduce operating costs, improve performance and better communicate the value of IT to the business. IT leaders often inherit a complex environment comprised of systems that have been homegrown, purchased or added through various mergers. They are then faced with the daunting task of evolving the IT portfolio to align with changing business priorities and emerging technical trends. UMT IT 360 platform and combines application portfolio management (APM), IT financial management and project portfolio management (PPM) best practices to provide a comprehensive Application Centric Planning framework. UMT IT 360 consolidates asset, project, resource and financial data to provide a dynamic blueprint of the entire IT environment. The solution helps CIOs, IT Portfolio Managers, PMOs and CFOs effectively collaborate to identify, model and implement transformation strategies to deliver current and future state architectures that align with business priorities and deliver a competitive advantage. There are those who feel an emotional need to share how they’re feeling about the topic. There are those who need a specific list of assigned tasks to come out of the meeting. And lastly, there are those people who don’t feel the meeting is complete until they’ve walked up to the white board and drawn a couple of circles and squares and have put an intellectual framework around the topic at hand. This post is for the latter group. It comes out of some recent discussions I’ve had where we’ve stepped back and taken a more macro view of the current enterprise work management system. In fact, the diagrams below grew out of a couple of doodles I ended up drawing in my notes after a recent discussion. Function: A team or group of people and the tools they use to carry out one or more Processes or Activities. Process: A structured set of Activities designed to accomplish a specific Objective. A Process takes one or more defined inputs and turns them into defined outputs. So we’ve got functions that utilize multiple processes. Hence one of the goals of process definition is to define the outputs required to support the functions. At the enterprise level, we’re talking about the outputs required from local processes to support enterprise functions – such as resource management and allocation. 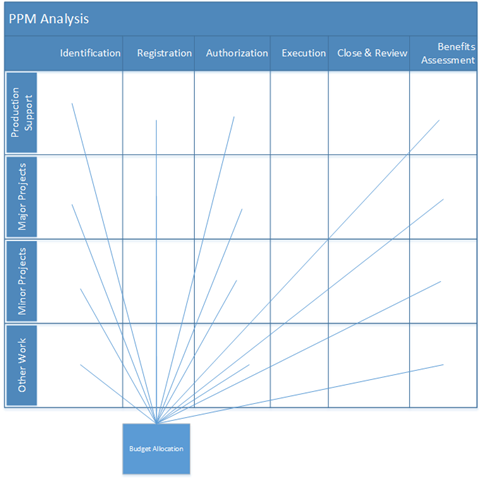 So far so good, but how does that apply to the EPM context? Typically, you take the project lifecycle, break it down into processes, and then map the output of the processes to the required functions. Most often, those outputs take the form of reports on process data. Identify the inventory of work types within the system. Identify the processes required to support each work type. 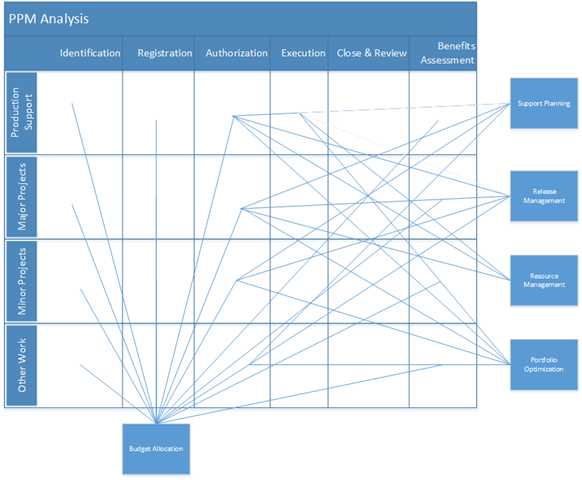 Identify the required enterprise functions to support governance. Map the outputs of the processes to the required inputs of the enterprise functions. At the end, it should look something like this – with each line representing an organizational control process, data flow, or report. …and since the data all needs to be pulled from the processes, this can be turned around as input into the process design to ensure that the appropriate control points have been inserted into the process to ensure the function has what it needs to, well, function. Identify all of the work in the organization. Identify the total work capacity of the organization. Identify how the organization makes decisions and codify this into a set of automated rules.